Good on you for not being a betting man. What makes you believe that Rudd will win the election? Far to many people don't trust Abbott, the memory of Work Choices; for one thing, is still very close for many. I gave up betting while I was still at school; One San Domenico was favourite and there were hundreds of thousands of Pounds bet on him (including my modest 2/-). He had won just about every race entered up 'till that fateful day. My 2/- taught me that betting was a mug's game and I've never had a bet since. 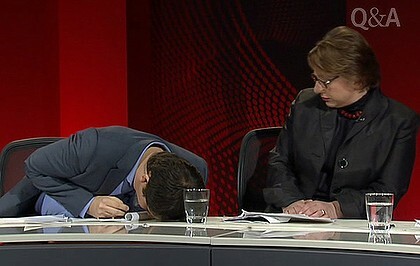 The flip side to that is a lot of people don't like Gillard until they meet her. Spot on I think; many have said that she's quite personable face to face. Ditto for Abbott, and I can personally say the same for Barnaby Joyce. Ah well! There's always the next erection election which Labor will win. ... except Barney the Carney had Gina "$2/hr" Rinehart with him for his win, so we can expect a lot of sense out of him for all of us working types. What? She's an "untouchable" or has the plague or something? Not invited round for your dinner party I guess. ABC 792 ("Our ABC") broadcast some learned types chatting about the Coalition's spectacular victory. Consoling themselves on their personal grief with kind words, hugs and kisses and the likes. Said one learned academic to his colleagues and the host, it wasn't that bad as various ex ALP ministers remained. The election was really just "quasi deviating with a bit of maintaining" ......... (exact quote). This leaked email indicates that the nauseating Sophie Mirrabella is in a bit of strife. The odious one has conceded defeat. That's a nice peice of news for Australia in general, and our parliament in particular. In the broader scene, the major parties now miss out on more than 20% of the primary vote. One wonders when they will start to get the point. The majors get a very major share of the entire vote. What exactly is the not so apparent point to be gotten? Certainly you can't please all of the people all of the time.